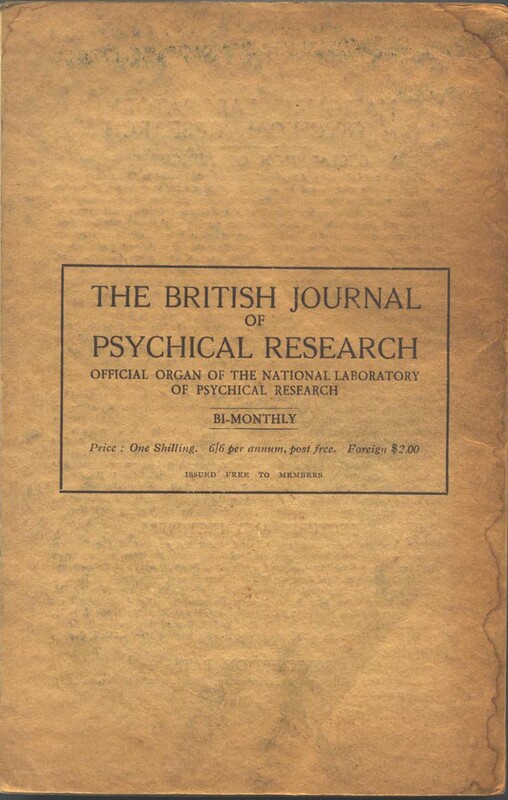 The main purpose of the Library of the National Laboratory of Psychical Research is to assist the serious investigator in detecting the psychic impostor, at the same time enabling him to recognise a genuine phenomenon if and when he sees it. Psychical research, spiritualism, psychology, occultism, mysticism, dowsing, poltergeists, mediums, miracles, dreams, clairvoyance, visionaries, prophets, previsions, ghosts, hypnotism, Mesmerism, apparitions, trance, thought transference, automatic writing, second sight, alleged abnormal photography, levitation, stigmatisation, telekinesis, hallucinations, hauntings, the subconscious, survival, "evil eye," slate-writing, table-turning, fortune-tellers, "spirit" paintings, crystal gazing, psychometry, divining-rod, fourth dimension, "matter through matter," muscle reading, "mummifiers," ecstasy, prodigies, divination, fire-walking, "strokers," fakirism, faith healing, Lourdes, auto-suggestion, blood miracles, animal psychology, fire handling, the Devil, diablerie, black magic, sorcery, superstitions, witchcraft, "black art," astrology (exposure of), sand- and figure-casters, phantasmagoria, vampirism, fairies, poison eaters, natural magic, conjuring, legerdemain, magic, sleight-of-hand, ventriloquism, illusions, pseudo-phenomena, water-spouters, charlatanism, simulation of natural phenomena, vaudeville telepathy, chemical tricks, Chinese magic, alleged feats of endurance, "fasting women," trick escapes from fetters, fire-eaters, mirror illusions, human transposition, magical vivisection, lighting illusions, trick apparatus, "human ostriches," optical illusions, cinematograph tricks, juggling, Indian magicians, "Indian rope trick," Eastern magic, mental magic, "thought reading," pseudo-Mesmerism, miraculous cures, Joanna Southcott, hand-shadows, magical secrets of the Greek temples, invisible inks, secret writings, suspended animation, gamblers' tricks, radio and electrical -tricks, regurgitators, luminous and radio-active substances, memory tricks, lightning calculators, sword swallowers, automata, cryptography, mnemonics, trick knots and ties, the Thaumaturgists, tricks in physics, confidence men, card sharpers, miracle mongers, "strength resisters," "magnetic ladies," demoniacs, "the Magnetisers," pretended miracles, Pepper's ghost, cartomancy, card tricks, mathematical magic, the Zancigs, coin tricks, photographic tricks, sealed billet reading, string tricks, planchette, mock auctioneers, "bunko games," and "quacks." The Collection is particularly rich in 16tb century occult works amongst which are the following rarities: Angeli de Gambilionibus, Tractatus maleficorum . . . Lyon c.1490 (Black Letter). Scot's Discoverie of Witchcraft, London 1584, (Black Letter), first book in the English language to contain conjuring tricks as we know them); Masse's De l'imposture et tromperie des diables . . . Paris 1579; Romberch's Congestorium artificiose memorie . . . Venice 1533; Bodin's De magorum demonomania, 1581; Lemme's Les occultes merveilles . . . Paris 1574; Du Triez, Les ruses, finesses et impostures des espritz malins . . . Cambray, 1563; Bodin's De la demonamanie des sorciers, Anvers, 1593; Jean Wier's Histoire, disputes et discours des illusions et imposture des diables . . . Genève 1579; Cattan's La géomance du Seigneur Christofe du Cattan . . . Paris 1571, and many others. Of the books on legerdemain, Samuel Rid's (or Samuel Rowland) Tile Art of Iugling or Legerdemaine, London 1614, Black Letter, is the rarest. There is also a first edition of Hocvs Pocvs Ivnior, London 1634, which is excessively rare. A long run of Dean's Whole Art of Legerdemain; or Hocus Pocus in Perfection belongs to this section which contains most of the old books on conjuring. An excessively rare book is John Heydon's A New Method of Rosie Crucian Physick . . . for the Cure of all Diseases, London 1658, one copy only appearing for sale in England during a period of 30 years. Other rare and interesting items, some of which are illustrated in this volume, are : A Nunnes Prophesie, or, The Fall of Friers. Contayning the downefall of the Pope, by the Vnicorne of the West; prophesied 300 years agone, and fulfilled in this present age 1615. London 1615, Black Letter; James Mason's The Anatomic of Sorcerie Wherein the Wicked Impietie of Charmers, Inchanters, and such like, is discovered and confuted. London 1612; A Whip for the Devil; or, The Roman Conjuror. Discovering the Intolerable Folly, Profaneness & Superstition of the Papists, in Endeavouring to Cast the Devil Out of tile Bodies of Men and Women, London 1683, with a most amusing engraved frontispiece of "whipping out ye devils"; Magical Vision, or a Perfect Discoverie of the Fallacies of Witchcraft, London 1693. Pierre le Loyer's A Treatise of Specters or Straunge Sights, London 1605, The Tyburn Ghost, London 1678, etc., etc. One of the most extraordinary books in the National Laboratory Collection is by Francis Potter, B.D., and is a first edition of An Interpretation of the Number 666. Wherein not onely the Manner, how this Number ought to be Interpreted is Clearely Proved and Demonstrated . . . Oxford 1642. This is a remarkable book on the theory of the Beast, in connection with various Romish institutions, commended by Richard Mead (1673-1754) as a wonderful discovery, "the happiest that ever yet came into the world." Pepys, who read the book in 1666 considered it "mighty ingenious." A set of the rare first editions of Danial Defoe's occult books belongs to this section which includes also a number of works by William Lilly (1602-1681) ) the prognosticator. Concerning the works on charlatanism, their name is legion. Two by the famous and witty Dean Swift are extremely amusing. Towards the end of the 17th century there flourished a quack almanack maker named John Partridge (i.e. Hewsan) who issued a volume of his "prognostications" annually. In his Almanack for 1707 Partridge warned the public against "rivals and impostors." This was too much for Jonathan Swift who, under the pseudonym of "Isaac Bickerstaff," a name, borrowed from a sign in Long Acre, at once issued his Predictions for the Year 1708 by Isaac Bickerstaff, Esq., Written to Prevent the People of England being Imposed upon by Vulgar Almanac Makers. This cruelly biting satire made London rock with laughter. Amongst the ridiculous "predictions" was one in which it was solemnly stated that on the 29th of March at 11 o'clock at night, "Partridge, the almanac maker should infallibly die of a raging fever." On March 30th "Isaac Bickerstaff" issued a letter to the press saying that Partridge had died the previous night according to his prediction. The papers entered into the fun of the thing and published fictitious accounts of the quack astrologer's sad end. The "flying stationers" (itinerant newsvendors) of the Metropolis immediately printed "penny elegies" on the death of the almanack maker and hawked them about London. Partridge was widely deplored in obituary notices and his name was struck off the rolls at Stationer's Hall. Partridge was furious and had to issue a special almanack for the same year proving that he was alive, very foolishly adding that he was "also alive" on the day when "the knave Bickerstaff" asserted that he had died of fever. This elicited Swift's most amusing Bickerstaff's Almanack; or a Vindication of the Stars, London 1710 (issued in April 1709) in which he "proved" that Partridge was really dead. All this ridicule killed the almanack trade for some years and Partridge died in reality in 1715. Another of Swift's satires belonging to the National Laboratory Collection is The Wonder of all the Wonders that Ever the World Wondered At, London 1722, which is an extravagant skit on the Hocus Pocus books of the period. Gustavus Katterfelto, (d. 1799) a Prussian quack doctor, astrologer and conjurer, in after years took Swift's pamphlet as a model for his advertisements, and his notices headed "Wonders! Wonders! Wonders!" were a familiar sight in the coffee houses of the period. Another rare work exposing the charlatans is Curious Enquiries . . . The Tricks of the Astrological Quacks, London 1688. Books relating to psychic and other impostors will be found in great profusion. Besides the works dealing with the fraudulent mediums, there will also be found sets of pamphlets on the amazing case of Mary Toft, the "Guildford rabbit breeder" (see cartoon reproduced); "Princess Caraboo," the country serving wench who fooled half England; the "Yatton demoniac"; the "fasting women"; the pseudofakirs; the "magnetic ladies" whose "strength resisting" feats appear marvellous - until one knows how the tricks are done; the "water spouters," prognosticators, and tracts relating to every phase of charlatanism. Many of these items are pamphlets, often the rarest - because the most ephemeral - form of literature. One exceptionally rare brochure is The Falacie of the Great Water-drinker Discovered., etc., London 1650, which deals with the tricks of Floram Marchand, Manfré, and their imitators. The National Laboratory Library contains an extraordinary collection (probably two hundred) of codes and methods for simulating the effects of telepathy and thought transference, for vaudeville use. This particular form of entertainment is very ancient and we find conjurers as far back as Pinetti and Robert-Houdin delighting their audiences with this form of "magic." Amongst the rarities is Second Sight for Amateurs by "Cavendish" (Henry Jones), of which 25 copies only were privately printed. The Laboratory Collection contains two specimens, including the author's own enlarged and annotated copy. In this section will be found hundreds of works exposing the tricks of such star performers as Annie Eva Fay, "Dr." Henry Slade, Washington Irving Bishop, Mrs. Mellon, the Fox Sisters, Anna Rothe, Buguet, Mumler, the Davenport brothers, and a host of modern mediums. Those who think that the Davenports may have had some psychic power need only glance at the collection of their showbills (one of which is reproduced) to have this illusion dispelled, apart from the fact that one of the brothers confessed (4). (4) A Magician Among the Spirits by Harry Houdini, New York 1924, p.26ff. The principal books on psychical research will be found in the pages of the Catalogue. No attempt has been made to collect modern works on spiritualism, per se, because books of this description, like the poor, are always with us and many libraries exist where they may be consulted. However, a few have been acquired in various ways. The Collection includes two copies of the rarest book known to psychical researchers. This is Viscount Adare's Experiences in Spiritualism with Mr. D. D. Home, London 1870. This work (of which only 50 copies were printed) was issued privately to friends and was afterwards withdrawn. A reproduction of the title-page is included in this volume. Charles Lancelin's famous book (La Fraude dans la Production des Phénomènes mediumiques) on the tricks of the mediums is included in this section; it is excessively rare and is unknown to most bibliographers. Only 250 copies were printed and given to friends. Other rare works on psychical research are: Mesmer's Mémoire sur la Découverte du Magnétisme Animal, Genève 1779; Dämmerung's pamphlets on the "spirit" photographs of Mumler of Boston, published in Vienna, 1863; Oscar Simony's pamphlets on his attempts to make knots in endless bands (inspired by the Zöllner-Slade experiments) ; the protocols of the prosecution of the photographic mediums, Mumler and Buguet, and many others. The Collection includes also many works an animal psychology (the late Karl Krall's experiments with the Elberfeld horses, etc. ), automata, mnemonics, the Fox sisters, Davenport brothers, "Margery" (the Boston medium), psychic photography, etc., etc. This Catalogue contains particulars of a number of MSS. and letters. Of the former the Burmese MS. on Indian magic is extremely interesting. Of the letters, perhaps the most valuable are those written by Daniel Dunglas Home, the medium. The one in which he describes his persecution in Rome (just before he was expelled) is probably the most interesting Home letter extant, and a portion of it has been reproduced in this volume. Of almost historical interest is the collection of original letters from the Archbishops and Bishops of Great Britain giving their views on the opening of Joanna Southcott's mysterious "box" which was sent to the National Laboratory. It will be remembered that we x-rayed the box before opening. The box, too, remains in the possession of the Laboratory. Those members of the Laboratory who think that the late Harry Houdini was an utter sceptic in psychic matters will find in his letters evidence that be was convinced that a "spirit extra" of the late Professor James Hyslop, produced by an amateur photographic medium, was a genuine one. His attitude towards spiritualism is clearly indicated in his correspondence. Amongst the scrap-books are two of outstanding interest. One contains fifteen hundred old handbills, letters, trade-cards, title-pages of almanacks, press cuttings, etc., etc., relating to the old-time astrologers and other quacks. This is an amazing book and weeks could be spent in its perusal. It was once, apparently, the property of a well-known astrologer named E. Procter who flourished between 1820 and 1840. Procter collected much information concerning his friends and trade rivals and his annotations throughout the book are most amusing and informative. A history of astrology during the first half of the nineteenth century could be compiled from this scrap-book. Even some of the letters from the victims who patronised these charlatans are preserved and the following is a specimen of the amazing credulity exhibited by the "clients" of these empirics: "Hystret Merthyr March 14th 1838. Most Respected Sir, - I received youer Ansur & Hop you give mee carect instructian to invok The Angel Tarchael. The Rite ingredients For Fumigatian A perticaler garments if Requiered. The Dementian of curcle of Defence For Safety and Place were to invok this Spirit Sir I Hop you will Inform Mee So Far as it Lays in youer Power. youer Most Humble and Obedient Sarvant Thos Thomas." Whether the writer ever found the correct "Dementian of curcle" or what happened if - and when - the "Angel Tarchael" appeared, the book does not reveal (5). (5) For a full account of the contents of this scrap-book, see Five Hundred Years of Magic by Harry Price, "Magazine of Magic," London, February, 1921. The second scrap-book of note is devoted to playing cards, cardsharpers, gamblers' tricks, etc. It contains about six hundred coloured and other engravings by Cruikshank, Bunbury, etc., and the collection includes the rare coloured Tranby Craft cartoon of the baccarat scandal (1891) in which the late King Edward (when Prince of Wales) was involved. Other scrap-books contain showbills and programs of the old mediums, with press cuttings, illustrations, portraits, etc. A portfolio of coloured aquatints, engravings, mezzotints, portraits, and scenes depicting the old magicians and charlatans at their performances ably illustrate the works referring to these men, and amongst the rarities are: A portrait of Pinchbeck (maker of automata) by Faber, the famous mezzotinter; coloured aquatint of Bartholomew Fair showing Fawkes, the conjurer at work; old French conjurers and charlatans; Abomination des Sorciers (witches sabbat) by Jasper Isac (1618), (reproduced); Hollar's engraving of Manfré the "water-spouter" (1651), (reproduced), etc. Of special interest to psychical researchers are the two original pen-and-ink sketches of J. N. Maskelyne and Archdeacon Colley (reproduced in this Catalogue), which were published in the Daily Graphic (April 1907) during the trial of the action re the "£1,000 ghost." J. J. Chalon's clever coloured aquatint of the French charlatan (1830) forms our Frontispiece. The Collection of the National Laboratory boasts a numismatic section and in it is to be found the beautiful silver medallion of Mesmer which was presented (Paris, May 1847) to Dr. John Elliotson (1791-1868) the great exponent of Mesmerism and editor of The Zoist. It is not generally known that although Dr. Elliotson was branded as a "quack" by his contemporaries, he was one of the founders of University College, London. A set of the Askins ventriloquial tokens (1797) is in mint condition and the Collection includes a fine large medallion of Ernesto Bellini, the telepathist and a gold medal presented to Bellachini, the Berlin Court conjurer. Palming coins, advertising pieces and presentation medallions of the Egyptian Hall complete this section. A number of technical works dealing with finger-prints, radio active substances, ambidexterity, regurgitation, what can be done with the mouth, handwriting, chemistry, examination of documents, etc., are included in the National Laboratory Collection as they are absolutely essential to the study and scientific investigation of alleged abnormal phenomena. At first sight a few of the books do not appear to be connected with magic or psychical research; but they have been included for a definite reason and are germane to our subject. A series of packs of marked playing-cards as used by gamblers will be found useful in checking the results of telepathic experiments in which cards have been employed. A number of useful cross references have been inserted in the list of books, but it is not pretended that they are exhaustive; they indicate merely some of the more important works and increase the utility of the Catalogue. 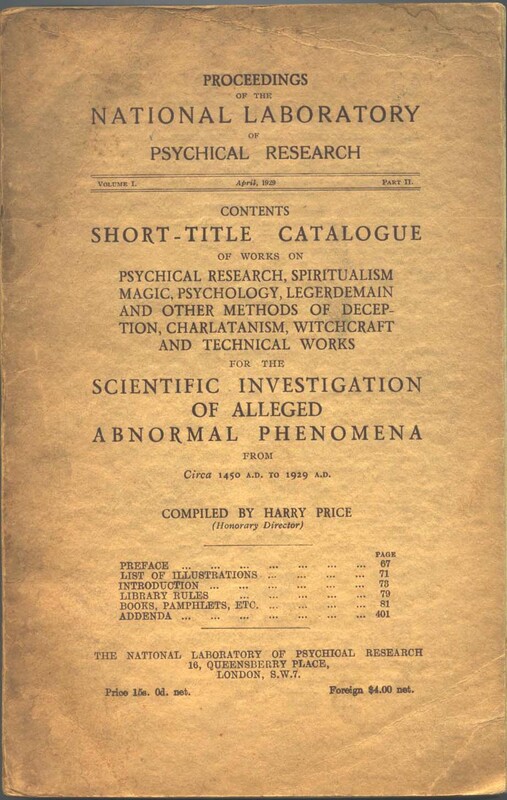 In conclusion, it should be mentioned that the student, by diligent search amongst the books and documents of the National Laboratory of Psychical Research, may become acquainted with the work of every medium, magician, and - especially - charlatan who has graced the world's psychic stage far the past five hundred years. If I lay stress on the word "charlatan" it is because a vast proportion of the so-called abnormal manifestations which have amazed the credulous throughout the ages has been produced by fraudulent means. But if many phenomena are due to self-deception and conscious and subconscious fraud, there is a residuum which demands investigation; and it is for the serious student who realises this fact that the present Catalogue has been compiled.